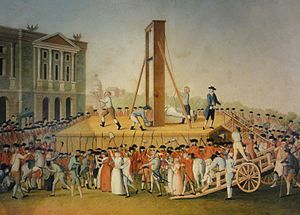 A guillotine (French: [ɡijɔtin]) is an apparatus designed for efficiently carryin oot executions bi beheidin. The device conseests o a taw, upricht frame in which a wechtit an angled blad is raised tae the tap an suspendit. The condemned person is secured wi stocks at the bottom o the frame, poseetionin the neck directly ablo the blad. The blad is then released, tae faw swiftly an forcefully decapitatin the veectim wi a single pass sae that the heid faws intae a basket ablo. This page wis last eeditit on 16 Apryle 2017, at 03:22.